Community Living Chatham-Kent believes in discovering dreams and connecting lives. Ebony Vandenbogaerde of Chatham is learning to discover new dreams as she navigates her next journey. Ebony was treated to remove a rare tumor in her spine in May, which has left her paralyzed from the waist down. Since this time she has spent months between London and Toronto hospitals recuperating from the surgery. This past weekend was Ebony’s first visit back to Chatham since her initial surgery. The daily costs associated to transport and provide the needed resources for Ebony are growing, explained Maria, Ebony’s mother. Renting an accessible vehicle to bring Ebony home comes with a price tag. 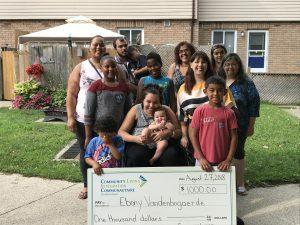 From proceeds of Community Living Chatham-Kent’s 3rd Annual Food Crawl, we were delighted to donate $1,000 to Ebony to assist in offsetting some costs the family is incurring. Ebony (center), her mother Maria, and family members were presented with a cheque by Angela Corso, Community Relations Manager. The Annual Food Crawl held on July 19, featured a collection of savory items from various restaurants in Chatham-Kent. This night was a fantastic opportunity to try new foods, mingle with a group of friends, and celebrate summer! May is Community Living Month! CLC-K delivers over 3,100 Box Lunches throughout Chatham-Kent this year! Interested in Techonology Use in Daily Activities & Social Life? Volunteering your time and talents contribute to provide supports and services for people who have an intellectual disability. Community Living Chatham-Kent is a non-profit charitable organization providing support and services for people who have an intellectual disability. For over 60 years, the agency ensures that all people live in a state of dignity, share in all elements of living in the community and have the opportunity to participate effectively. Get the latest Community Living Chatham-Kent news, event and sponsorship details, and planned giving information.